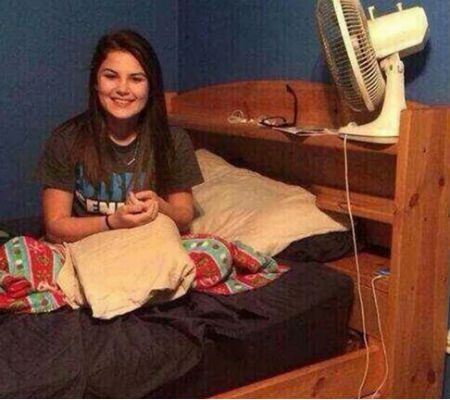 Rumor: A man divorced his wife after he examined a photograph of her and spotted a man hiding under her bed. A man divorced his wife after he examined a photograph of her and spotted a man hiding under her bed. There’s supposedly a man hiding in this picture under the bed. Is this for real or a waste of one’s internet time? Origins: On 24 January 2015, the web site ViralNova published a seemingly innocent photograph of a young woman sitting on her bed. After coming home from being away for 20 days, a husband took this photo of his wife. It seemed innocent, maybe even sweet. However, he took a closer look and saw something that would change their lives forever. Do you see it? A man, whom the wife was cheating with, was hiding under the bed the entire time. The husband didn’t see it until he looked at the photo again. A man killed his wife after returning from vacation. When the police asked him why he killed his wife, he showed him this photo. Can you see why he killed his wife? The stories that are most commonly circulated in tandem with this photograph are almost certainly false, given that no one has turned up any official report or news story linking this image to a real-life divorce and/or murder, the narratives attached to the image have changed several times over, and the scenario pictured here (i.e., a young girl in a twin bed) is not one that generally corresponds to a depiction of a married woman.